Police Commissioner Bill Bratton began his shakeup of the top ranks of the NYPD Tuesday, putting the heads of the detective and internal affairs bureaus on notice, sources say. ONE POLICE PLAZA — The NYPD shakeup has started. The Chief of Detectives and the head of the Internal Affairs Bureau are being replaced following a series of meetings with Police Commissioner Bill Bratton — two of the most high-profile moves made by the new commissioner, sources told On the Inside. During the powwows Tuesday morning, Bratton disclosed changes to two of the NYPD's most important bureaus — the first major step towards putting his stamp on the department. The commissioner told Philip Pulaski, the hard-charging three star chief in charge of the city’s detective bureau, and Charles Campisi, the longstanding chief in charge of combating corruption and police misconduct, that their services with the NYPD are coming to an end, sources said. “He thanked them for their valued and long service to the department, and said he planned to make changes,” one source said. It was not clear when they would step down. Campisi, who has some 40 years on the force, has been in charge of Internal Affairs for for nearly two decades, overseeing an expansion of the unit and its role in monitoring the integrity of New York’s Finest. 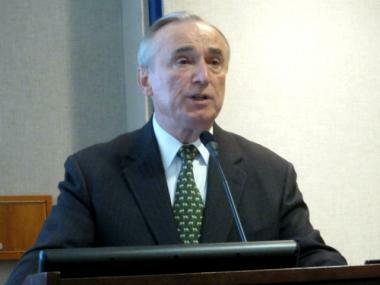 Insiders say that IAB became more widely known for petty enforcement such as towing improperly parked police vehicles and worrying about who was issued NYPD parking placards rather than fighting corruption during the past 12 years when Police Commissioner Raymond Kelly ran the NYPD. In fact, many of the most serious corruption cases against city officers under Campisi's watch were brought by federal agents. His successor will likely be Chief Joseph Reznick, a veteran investigative boss presently in charge of the NYPD’s Narcotics Division, sources said. Pulaski, 62, who has been the chief of detectives since 2010, is widely viewed as an extremely bright, hardworking official. He holds both law and engineering degrees and has held several of the NYPD’s most glamorous positions, including serving as a co-commander of the FBI-NYPD Joint Terrorist Task Force and Chief of Manhattan Detectives. He is also credited with modernizing the NYPD's lab. But his reign atop the detective bureau has been viewed as a reign of terror by many of the men and women he commands — and morale in the bureau has fallen to depths not seen in recent memory, those inside the department said. While managing to bring cutting-edge technology to the bureau, he also instituted a checklist approach that stripped detectives of some of their investigative independence. And many bosses devoted to the NYPD simply retired rather than face a constant barrage of seemingly needless questioning from Pulaski and his aides. Several hours after receiving the word from Bratton, Pulaski called his top commanders to Police Headquarters and told them he was proud of his legacy contributing to building an enormously successful crime fighting machine. He then formally filed for retirement. Sources say Chief Robert Boyce, the Manhattan detectives boss and a former head of the Gang Division, is expected to succeed Pulaski, a 33-year veteran. A department spokesman did not immediately return a call for comment.